Share skills, learn informally, pursue your hobbies and interests! Make friends and get more involved in your community! Are you stuck indoors too much? in an informal, relaxed setting? 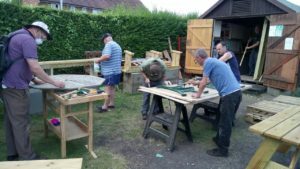 Do you like working with tools, repairing and mending, DIY projects? For further information, please contact Danny on 07532 794173 or danny@activlives.org.uk, or ActivLives office: 01473 345350. Freshly picked produce, plants and flowers from ActivGardens. 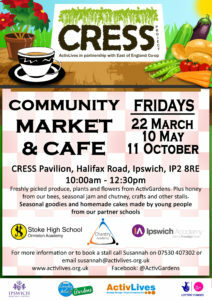 Plus honey from our bees, seasonal jam and chutney, crafts and other stalls. Seasonal goodies and homemade cakes made by young people from our partner schools.